A Seminar on Farm Field School plus Information and Communication Technologies(ICTs) for Poverty Reduction was held on December 13 in Kunming, the capital city of China’s southwest Yunnan Province. Experts in agricultural technology, e-commerce, charity work and communication discussed how to promote agriculture development via ICTs in order to bring technology to farmers and increase their income. 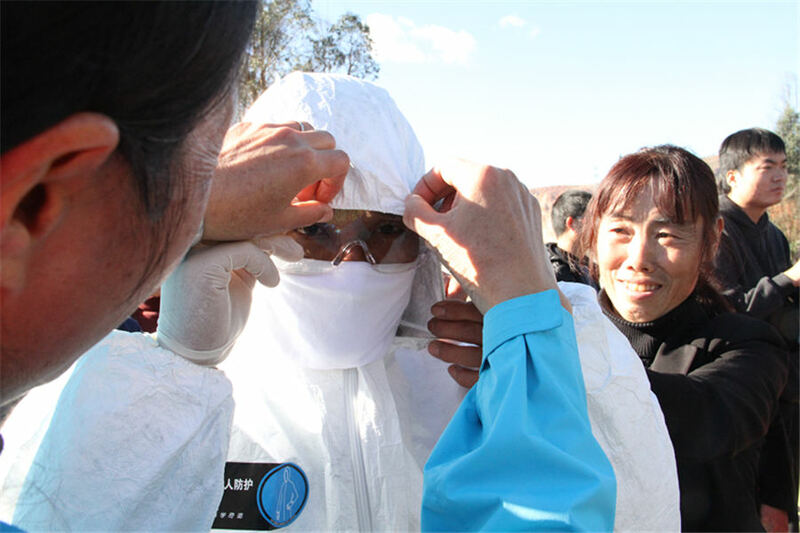 Hosted by the Food and Agriculture Organization of the United Nations (FAO) and implemented by Kunming Plants Protection and Quarantine Station, the seminar was co-organized by National Agro-Technical Extension and Service Center, and Yunnan Plants Protection and Quarantine Station. 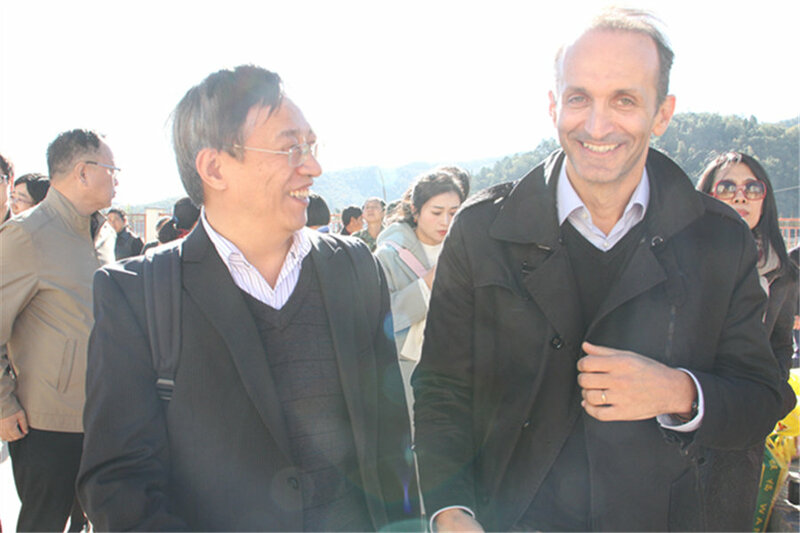 Dr. Vincent Martin, FAO Representative in China and DPR Korea (right), and Tian Yucheng, the chief engineer from CIIC (left), inspect the local school before the seminar. Yang Puyun, a researcher at the National Agro-Technical Extension and Service Center, said that FAO’s project had introduced Chinese farmers to a new concept. As a result of continuous experimentation and improvement, a participatory training method has been developed. In the recent two decades, FAO has helped to build more than 6,000 Farmer Field Schools, and trained more than 2,400 instructors and 160,000 farmers. Yang wished to introduce ICTs to promote this model via online and offline training. Li Yongchuan, head of the Yunnan Plants Protection and Quarantine Station, said that Yunnan is developing their agriculture based on the geographical and traditional characteristics. Melons, vegetables, fruits, herbal medicines, coffee and green tea are in great demand. Yunnan Province has achieved annual exports of U.S. $ 4.7 billion. The station has cooperated with FAO and the National Agro-Technical Extension and Service Center to promote integrated pest management and raise the quality and price of agricultural products. He explained that there are more than 400 instructors at the local school.. They helped farmers better organize themselves and taught them how to use pesticides in a safe and sustainable way. It is estimated that Yunnan Province has reduced the use of chemical pesticides by around 30% per acre. Within this figure, the use of highly toxic pesticides has decreased by 60%. Experts of internet field shared their experience of combining ICTs with agriculture. Tian Yucheng, Chief Engineer of China Internet Information Center introduced an application called “cloud platform for targeted poverty alleviation”. Using information management and cloud computing technology, it enables users to track the process from production to consumption. It has additional functions in areas such as agricultural loans, remote payments, and marketing. Jan Willem, Chief Technical Advisor and Team Leader from FAO Regional Integrated Pest Management Programme in the Regional Office for Asia and the Pacific, emphasized that FFS is open to all farmers. It is important for farmers to participate and share experience. Until 2016, this project was directed at health, climate change, animal husbandry, and environmental protection in more than 90 counties. Ultimately, he hoped that China’s targeted poverty reduction strategy can better serve developing countries. FFS is particularly suited for learning complex management skills like natural resource management, diversifying production, and accessing markets to increase rural incomes. It helps farmers to analyze, research and solve problems, and ultimately to improve their decision-making.